Thanks to the generosity of Drs Paul and Karen Sagal, our shul has received a beautiful new Memorial Board that is up and ready. 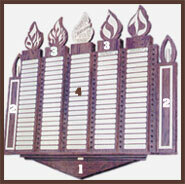 This beautiful new board, in the shape of a Torah, is a masterpiece, custom-made for Chabad of Las Cruces. If you would like loved ones memorialized on the new Board, please take the time to let us know by clicking below: There is no doubt that their neshamot will be comforted throughout the prayers and Mitzvot. The magnificent Memorial Walll offers dedication opportunities for your loved ones ensuring that a Yahrtzeit is never missed. For $300, your loved one's name and Yahrtzeit date will be displayed on a plaque. Each year during the month of the Yahrtzeit the flame near your loved one's name will be lit and will flicker in rememberance. As an additional bonus, a reminder letter and Yizkor candle will be sent to you free of charge before the Yartzeit to help you properly commemorate their day of passing. Payment plans are available. Contact our office at 575-524-1330. 1. Main dedication has been reserved. $1,800.00 in honor of the 6 million that perished in the Holocaust. 4. I would like to dedicate 0 1 2 3 4 5 6 7 8 9 10 plaque/s at $300 per name/plaque. Name on card Charge Amnt.